If you’re suffering from the effects of venous insufficiency, you can greatly benefit from compression therapy paired with regular use of compression garments. Varicose veins prevent proper blood flow throughout the leg muscles which can result in swelling, pain, and in some cases, numbness and loss of feeling. Our compression garments are effective in varicose vein relief and treating deep vein thrombosis, preventing blood clots, phlebitis, managing pain from leg ulcers, and reducing inflammation caused by arthritis. Compression stockings apply external pressure on the limbs of the legs. The regulated pressure of the stockings allows venous pressure to be reduced and, as a result, circulation increases. 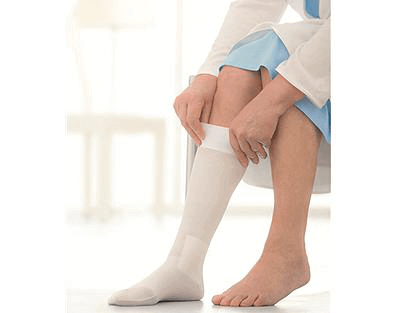 Compression stockings help ease the load on the circulatory system by supporting the natural contraction and relaxation of the muscles in the calf that support the leg veins. We’ll do a personal consultation to get you fitted for the best quality and most effective compression stockings on the market.